To make your videos more engaging AVR automatically disabled some items. 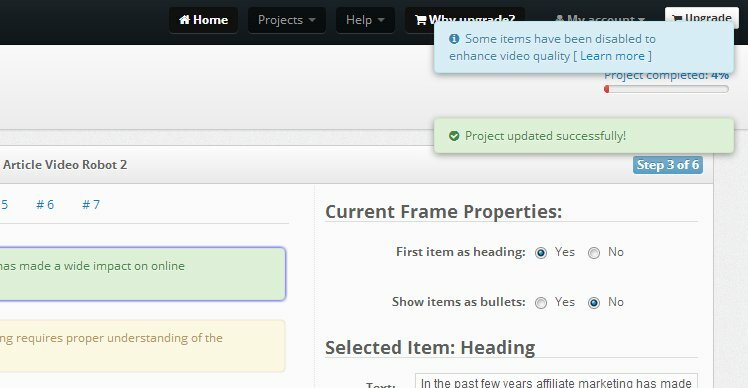 Our tests have shown that for best results a frame should not have more than 40 words, which is why we disable all items by default. When your frames are created for the first time you will notice this alert notifying you about the same. If you want to enable a disabled item, you can do so by clicking on it and selecting "Enable Item" menu option from the "Modify selected item" dropdown. We highly recommend that you should not have too many items in a frame.